Yesterday I made my monthly pilgrimage to Newbury Comics, mainly to purchase Van Morrison’s first official DVD. It contains his 1974 and 1980 performances at the Montreaux Jazz Festival. While there, I also snagged a copy of “Live Your Life With Verve: Fall Into The Groove,” a sampler of the latest releases from the legendary jazz label. Newbury typically gives away these label promotional collections, even if you don’t make a purchase. I was immediately taken by “St. Louis Blues” as performed by violinist Regina Carter, with Carla Cook on vocals. Not being a jazz authority, I didn’t recognize the name. I did a lttle research and found that she’d played violin on Madeline Peyroux’s debut CD, and has worked with Mary J. Blige, Billy Joel AND Dolly Parton – not to mention brilliant (but usual suspects) Wynton Marsalis and Cassandra Wilson. I think a lot of people look at the violin and they get a little nervous. They have a stereotype of what the violin is – very high, kind of shrill-sounding with long notes, and a lot of vibrato. It doesn’t have to be that at all, it can be a very fiery persuasive instrument and that’s how I like to use it. I don’t think of the music trying to fit the violin, or how to make the violin work in this music. For me, it just does. I’m not playing it as a violin. Instead of being so melodic, which I can be, I tend to use the instrument in more of a rhythmic way, using vamp rhythms or a lot of syncopated rhythms, approaching it more like a horn player does. So, I don’t feel that I have a lot of limitations – I feel like I can do anything. 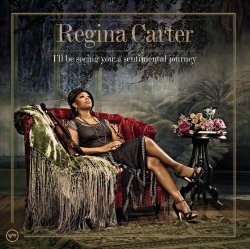 I immediately went and got “I’ll Be Seeing You: A Sentimental Journey,” her tribute to jazz’s foremost era of discovery and evolution. The 1920s through the 1940s were a time when performers like Duke Ellington and Louis Armstrong began defining an art form still in the process of being born. What’s brilliant about jazz is that it’s still being born, as Carter’s reworking of W.C. Handy’s classic proves. With “St. Louis Blues,” she takes her fiddle on a hayride to the other side of the tracks, to a shotgun shack down by the river, and in the process inspires her accompanists to also take their instruments to uncommon places. I’ve never heard a clarinet infused with old-time country, but Paquito D’Rivera sure does it well. Gil Goldstein’s spicy accordion is in entirely new territory as well. It’s amazing. You’ve gotta hear it, so damn the consequences, here’s a link. If the copyright cops find me, I’ll take my lumps, but please understand this is music promotion in the era where the radio powers won’t touch an artist like Regina Carter. I’m doing them a favor, a virtual version of their neat little sampler. They should be thanking me. Why can’t the labels get a grip on this concept and make it work? Buy the record, which is filled with many more gems.